The arrests of two black men at a Philadelphia store have not hurt sales so far. 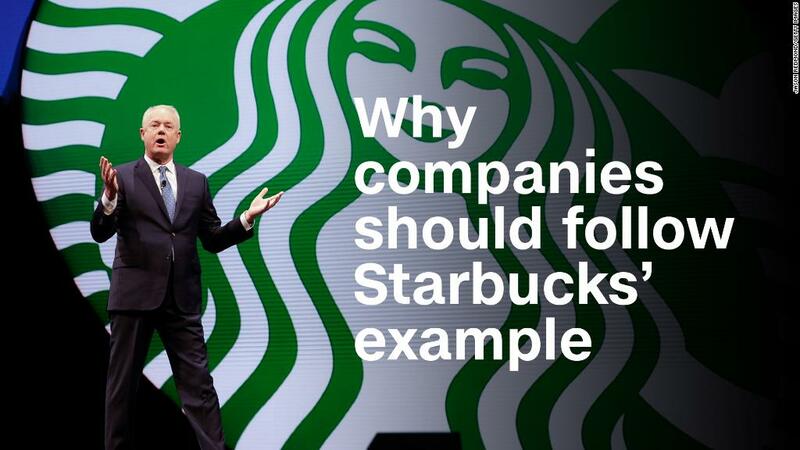 "It's still early... [but] we're not seeing an impact on ... sales as a result," of the incident, Starbucks CEO Kevin Johnson said during a conference call with analysts on Thursday. The company reported that sales at US stores open at least a year grew a modest 2% in the second quarter. Starbucks faced Wall Street for the first time since it was embroiled in the PR crisis when it shared earnings on Thursday. The company reported $6 billion in sales between January and March. That's up from $5.3 billion a year ago. Starbucks (SBUX) also added 1.6 million members to the Starbucks Rewards loyalty program in the United States, up 12% from last year. The news comes after two men, Rashon Nelson and Donte Robinson, were arrested at Starbucks for trespassing. The men did not order anything, but asked to use the bathroom while they waited for a meeting. A white store employee called 911 minutes after they arrived. Video of the arrest went viral, sparking protests and calls for boycotts. Starbucks CEO Kevin Johnson publicly apologized for the arrest and flew to Philadelphia to meet privately with Nelson and Robinson. Johnson and top Starbucks officials, including former chief executive Howard Schultz, remained in Philadelphia for days to meet with religious and community leaders in the city. Johnson said the measures Starbucks is taking to make sure an incident like this never happens again "will pay long-term dividends for Starbucks." The chain won praise for its decision last week to close its 8,000 company-owned stores in the United States for one afternoon on May 29 to provide racial bias training to about 175,000 workers. The training will be developed with guidance from experts including former Attorney General Eric Holder and Sherrilyn Ifill, the president of the NAACP Legal Defense and Education Fund. Johnson reiterated on Thursday that the training is just one of many steps the company plans to take. The costs from protests and the May 29 training won't show up until next quarter. Starbucks shares were down nearly 3% at one point following the earnings report. Last quarter, Starbucks reported sluggish growth at stores that have been open for at least a year because of a subpar holiday lineup. Starbucks (SBUX)' stock is down 3% since the arrests, and shares fell another 2% in afterhours trading Thursday. —CNNMoney's Paul R. La Monica and Seth Fiegerman contributed to this story.